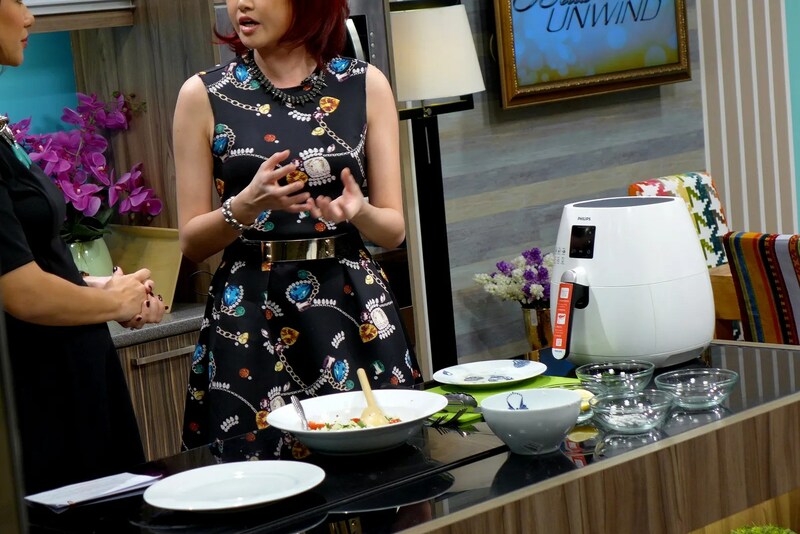 Following my last cooking demonstration on Bella Unwind NTV7, I didn’t expect to get another invitation so soon to cook another dish for Bella Unwind. This time the theme is Coffee, so the production team has suggested that I cook a savoury dish with coffee. After digging my brain for recipes, I decided to do a Coffee Brined Chicken pairing with a no-brainer: Cauliflower Rice. 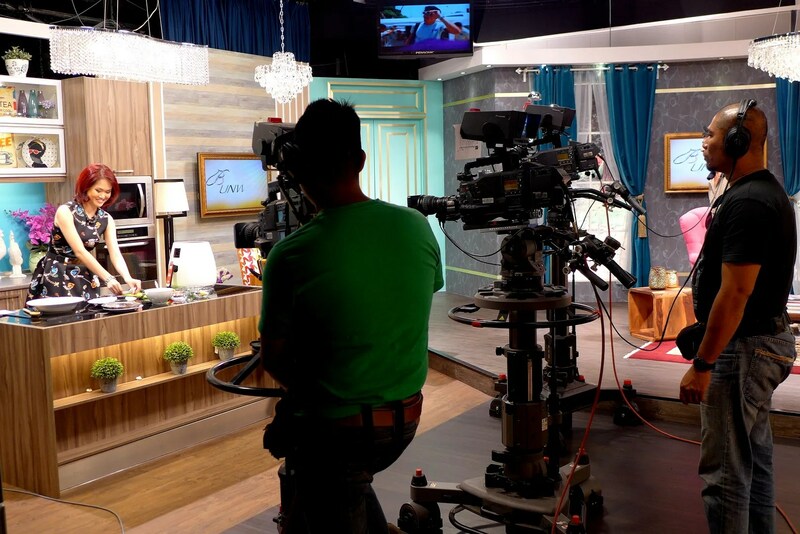 I will get to the recipe later, but here are some photos from the filming at NTV7 Studio. Setting my station for the demo. The host for the day was Elaine Daly who has that pregnancy radiance. We chatted about the benefits of using coffee in cooking, and also how to properly infuse coffee flavour without rendering the dish a bitter mess. She even managed to put me on the spot so I had to sing a little bit (without properly warming up my voice…. eeps! Should be more prepared next time). Lookie! It’s the Philips AirFryer! The studio has a fully equipped kitchen, but frying the chicken on pan might create a little too much smoke, so I decided to bring my airfryer along for a no-mess cooking process. The cooking itself was really simple. 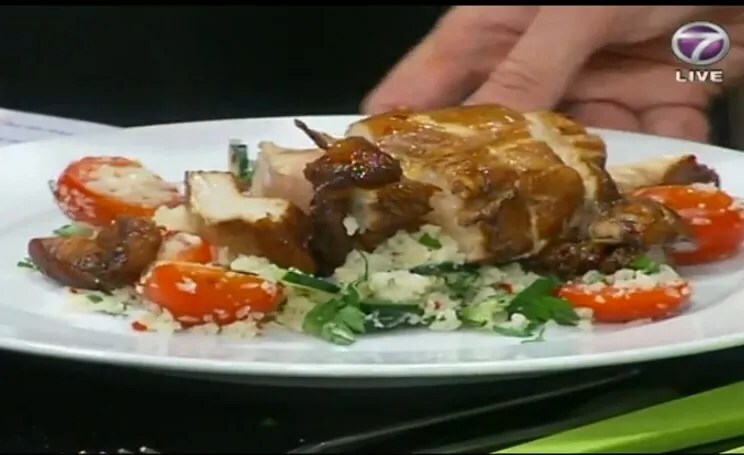 All I needed to do was combine prepped ingredients together while waiting for the chicken to cook itself in the airfryer, then it was time to plate! If you love the aroma of coffee, then you will enjoy this dish. The Chicken breast was bathed in the coffee mixture overnight, so the aroma really penetrated all the way. The accompanying spices add more depth to it, and the addition of sugar balances the bitterness of coffee. Of course, the brine contains salt, so this creates a balance of taste all round. It takes only about 15 minutes to put together, perfect for those with a busy lifestyle. Furthermore, this dish is Low-carb, High Protein, Paleo Friendly and Gluten Free! If only you can smell this! Tada! Plating a bit cacat because le nervous. But still a colourful dish. Combine all the brining ingredients and submerge the chicken breasts in the liquid, store in the fridge overnight. Before cooking, make sure it’s out of the fridge for at least an hour. Prep the airfryer, and set to 180degree Celsius heat. Place the chicken breast into the grill pan or basket and cook for suffficient time until just done (1 for 12 minutes, 2 for 15 minutes). 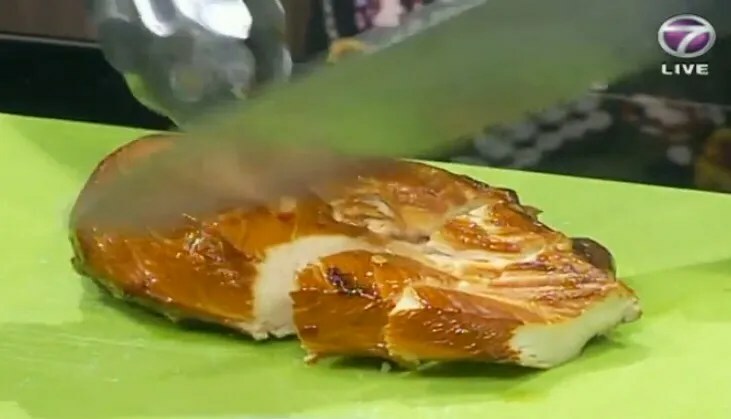 If you are not using an airfryer, you can just use a frying pan and cook for roughly 5 minutes each side, depending on the size of the breasts. Set aside and rest for 2 minutes before cutting. Blitz the cauliflower florets in a blender of food processor until rice like. You can use this raw, or cook for a minute or two to take the raw edge off. I lightly fry it with olive oil for about 2 minutes this time. Set aside until needed. Slice the cucumber thinly, and cut the cherry tomatoes in half. 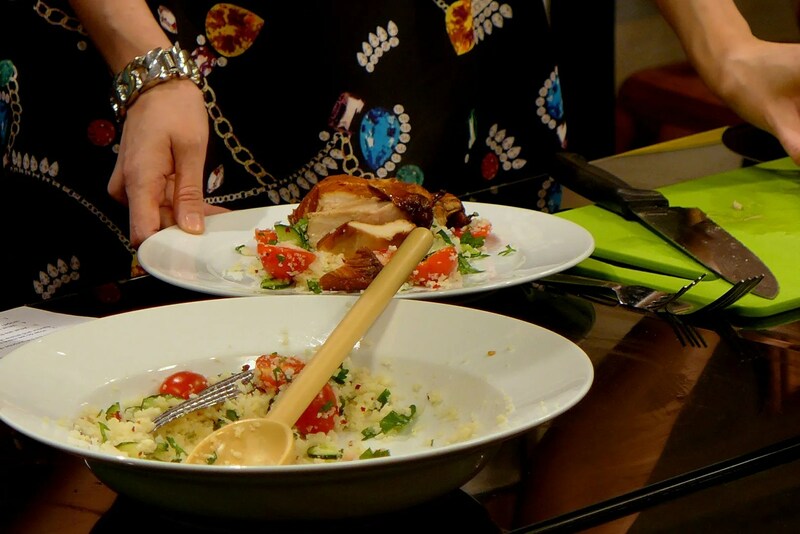 To assemble, combine cauli’rice’, cucumber, tomatoes, parsley. Sprinkle over the salt, and squeeze the lemon juice over, stir to combine. Place the sliced chicken breast on top and you are ready to serve! Enjoy this warm or room temperature. 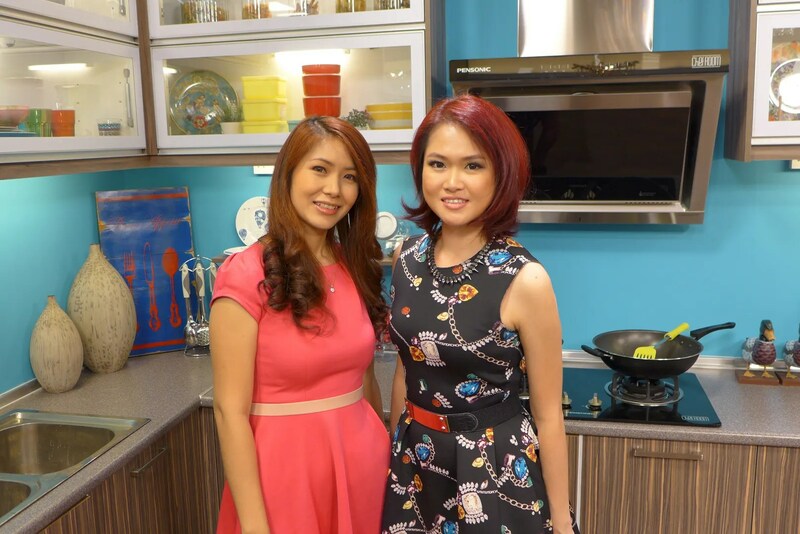 Thank you Bella NTV7 for inviting me! I hope to do more cooking demos for you in the near future. Always a good way to challenge myself this way, and also it really does take time to get used to live TV: no room for mistakes. If you are interested to watch the program, feel free to head to http://tonton.com.my to search for the 26th Feb Episode (I just watched it and I still looked silly…. must just be my normal persona). During the same episode Louise from Claire Organics demonstrated a few beauty tricks using ground coffee, and she was kind enough to give me some of her products. Do check out their facebook page, they have a wide range of skincare products using natural ingredients and everything is 100% chemical free. Thanks so much, I am now a fan!